Our Quarter Round gutters are an attractive gutter profile that will complement just about any style home. 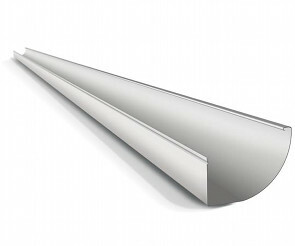 The partially flat base of the gutter profile enables the quarter round gutter to be used on any rebate fascia. The quarter round profile of the gutter efficiently channels even the smallest amount of water to the back of the gutter for disposal, thereby reducing silt and debris build up. This gutter also features a stiffened back edge that strengthens the gutter profile – this reduces the likelihood of any bowing or rippling along the gutter’s length, and ensure a quality (and straight) finish. Another feature is the optional slots in the front of the gutter that allow for excess water to overflow freely. The larger bend radii and the quarter round profile minimises the risk of micro-cracking that can cause premature corrosion. Available in the full spectrum of colours, the clean, attractive curves will compliment contemporary, heritage and architecturally designed homes. All of these features make the quarter round gutter style very easy to handle and install, especially for larger projects.